Extra wide fire breaks prepared beforehand enabled the AC Whitcher forestry team to do a back burn in howling winds, thus saving their Tsitsikamma plantation from the advancing wild fire. ‘Land of smoke and fire’ … this is what the early seafarers around the Cape called Outeniqualand and the Tsitsikamma, better known today as the ‘Garden Route’. True to this description, the mountain ranges in this area were ablaze for a period of about two weeks in late October to early November 2018. At one stage six main fires between Riversdal and the eastern Tsitsikamma (a distance of about 200 km) burned out of control under very extreme weather conditions. 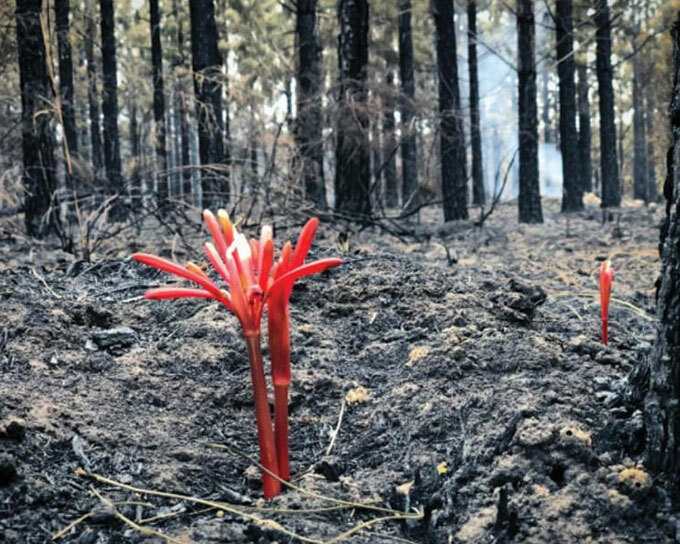 The most extensive wildfire since that famous milestone known as the Great Fire of 1869, it covered an area of more than 100 000 ha of fynbos and forestry plantations in the Outeniqua mountains and the Tsitsikamma, seriously threatening some George residential areas, claiming eight lives in a forest village, and ruining a sawmill and several other structures. This map shows the burn scar from the Outeniqua mountains fire. 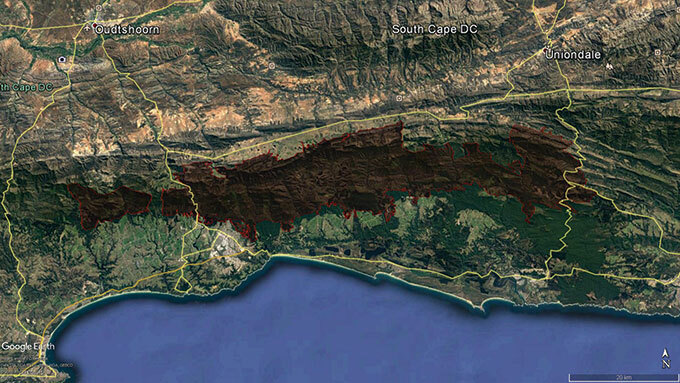 The Tsitsikamma and Riversdal fires burn scar is not shown. What were the conditions like when these fires started burning almost spontaneously over such a wide area? The Garden Route experienced below average rainfall for the greater part of this year, with the first good precipitation in September, after a late summer and abnormally warm spell during mid-winter months. It was followed by a late winter with very cold spells stretching into October, which in turn was followed by a heat wave in late October which lasted for more than a week. Temperatures as high as 40°C in Knysna were recorded, which is unheard of for this area. Extremely strong winds with gusts of up to 100 km/h blew in some parts of the Garden Route, while in others, like around George, the wind wasn’t that strong. However it is clear that the table was set for a disaster to happen. Some fires were lit by lightning strikes, others were of human origin, but whatever the trigger, it is a given that under such extreme conditions fires will occur and they will burn out of control with utter disregard for fire protection and defence measures applied (or not applied). The mountain veld, with some exceptions, was old, with a high accumulation of fuel, irrespective of the presence of invasive alien vegetation. Plantation areas under the MTO exit lease that were handed back to the Forest Department (DAFF), have after years of impasse not found a receiving land manager west of the Touw River (Wilderness), and have through neglect by DAFF developed into jungles of fynbos mixed with invader vegetation. At the same time the areas east of the Touw River, including many exit areas, transferred to SANParks to become part of the Garden Route National Park, have also not received the management treatment they should have had, owing to lack of resources. MTO Buffelsnek Plantation north of Knysna. One of the sad stories, as with Bergplaas. Lots of young plantations succumbed. They were planted up by MTO in lieu of DAFF planting up these recommissioned exit areas which didn’t happen. Now they are gone. The Sonskyn forest village escaped form burning. Last but not least, the Witfontein Plantation, bordering on the northern side of George residential areas, being the responsibility of the DAFF, through sheer neglect developed into a dense jungle of unmanaged pine stands since the 2002 fire, becoming a ticking time bomb. The George Peak fire got into this plantation and would most certainly have destroyed houses had it not been for a miraculous change in wind direction at a critical stage. • 3 700 ha in the Tsitsikamma under the sustainable lease agreement, 1 000 ha of which are too young to be salvaged. Besides, State indigenous forests appear to have sustained considerable damage not only to their fringes but in many places burning into the interior as the tinder dry forest floor and organic soil layer smoulders from burning debris tossed into the forest – until extinguished by the first soaking rains. 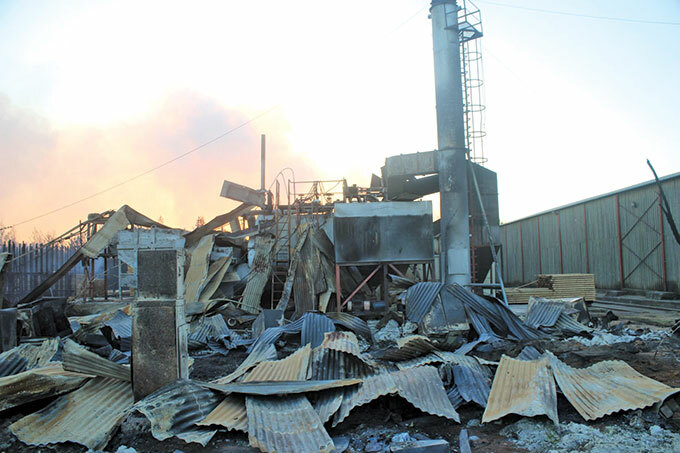 Private firms like PG Bison and Geelhoutvlei Timbers also suffered heavy blows to their plantations, the latter not only losing its plantations but also the sawmill that provided work for over 400 people. Post fire assessments on the extent of the damage caused by these 2018 fires and their impact on the forest industry still have to be done. However it’s clear that if one takes into account the accumulated losses from the fires of recent years, and especially the 2017 Garden Route fires, one must face the prospect that the viability of forestry in the Garden Route hangs in the balance. With timber supply now so disrupted that there are hardly any mature and maturing timber stands left – it is as if forestry has to be started from scratch. What the implications of this situation are for the local timber industry, in which many smaller processing firms rely on the larger timber growers for their raw timber supplies, are not difficult to predict. A timber shortage was in any case imminent from 2020 onwards. 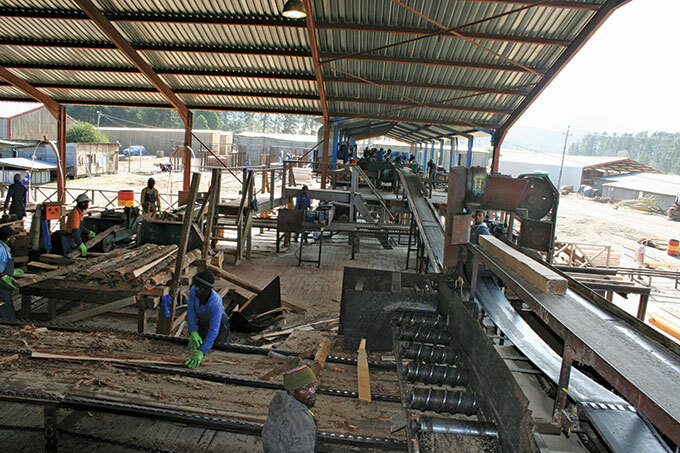 After the completion of the exit, the State plantations would only have been able to provide for MTO’s own raw timber needs, with no surpluses available for the smaller private firms, as is the situation currently. It is doubtful whether, after this disaster, MTO’s sawmill will have enough supply to keep it going in the long run. Geelhoutvlei Timbers, which, apart from its own plantations also sourced timber from large firms like MTO and PG Bison, is unlikely to rise from the ashes, so to speak. BEFORE: Geelhoutvlei Timbers sawmill in full swing before the fire. AFTER: All gone, consumed by the wild fire. Sawdust piles still smouldering in the background. I am by no means a pessimist, but reluctantly I have to say, this glum picture is probably the reality, whether we like it or not. For all practical purposes, the forest and timber industry as we knew it in the past, has come to a crossroads. Probably much to the glee of the greenies and anti-forestry activists, who, I believe, have already rejoiced over the demise of the ‘terrible’ pine plantations which they believe are the source of all evil in this neck of the woods and elsewhere, for besides all the bad things emanating from them like polluting the aesthetic landscape, dispersing invader pines into the natural vegetation and depleting our water resources, they are the prime reason why fires have burnt so fiercely in the past two years? In this they need to be reminded that invasive pinaster pines and hakeas have been in these mountains long before forestry entered the scene, having migrated with the westerly winds from the Cape Peninsula and Boland eastwards over a period of at least two centuries. Only in more recent years have new forestry species like radiata pine been added to the mix. Likewise that old, dense, high fynbos peculiar to this area also consumes groundwater – not much less than pine plantations. Last but not least, well managed, medium aged to mature pine stands, however flammable they may be, because of the spacing of the trees and where the forest floor is kept clean from undergrowth and accumulation of litter, do not necessarily burn with higher intensity than dense mature fynbos. Moreover, a network of roads and firebreaks makes them more accessible for fire fighting operations. Braam du Preez, a professional forester and forest fire expert and consultant in the Garden Route, told me that, with this last fire, the riparian zones, having developed into dense fynbos corridors between pine plantations, burnt with a higher intensity than the adjacent pine stands. The trees closest to the riparian zones were more seriously affected by the fire compared to trees a little further away. This interesting observation is evidence that the assumption that forestry plantations promote very hot wildfires as compared to fynbos, is not necessarily substantiated by facts. Comparisons are sometimes drawn between the recent fires of 2017 and 2018 in the Garden Route and the Great Fire that burnt everything in its way between Uitenhage and Swellendam in 1869. Back then, fires could burn unimpeded by human interference, and they burnt when conditions were most suitable for the dense fynbos to burn, lit by lightning or the early human inhabitants. The 1869 fire burnt for weeks, driven by hot and dry bergwinds following a couple of years of intense drought. The event certainly was unusual, but after the fire everything returned to normal, without a conflagration of that scale having occurred since. This can partly be ascribed to increasing human activities transforming the natural landscape, thereby restricting the natural spread of fires, but partly also to the moderate climatic patterns that prevailed over 100 odd years since that fire. MTO Bergplaas Plantation after the fire. Note how the forest station was surrounded by fire. The people there must have been frantic as they withdrew to the station during the fire and could not get out. Of course, they survived, thanks to the lack of fuel around the buildings. MTO photos courtesy Braam du Preez. Which brings me to this point of taking a critical look at what we have been experiencing regarding the climate and fires in more recent years, and what the future may hold. Let me first provide some background before I argue my point. I spent my early childhood in a small fishing village in the western Cape in times when the fishermen had to rely on the barometer and their knowledge of the weather before venturing out into the open sea. It taught me to observe the weather daily. In my later youth in Cape Town I continued with this habit, and, of course, in my forestry career it remained in the forefront. I can still recall weather events that occurred in my childhood days. We were sent home from school in Cape Town if the temperature exceeded 30°C, which rarely happened even during the hottest time of the year. Today temperatures deep into the 30s are quite common. I started my forestry training on a State plantation in the Western Cape where I became acquainted with controlled burning and fire fighting. I have a vivid memory of the seasonal weather of those years. The weather patterns were quite stable and fairly predictable, and climatic seasons followed the same pattern year after year. Bergwinds then were non-existent, as were flash floods and lightning storms with hail in summer, which in later years began to occur frequently. The first time I encountered bergwinds was in 1967 when I studied forestry at Saasveld near George. I noticed something strange in the weather when on holiday in the western Cape in 1979, a hot offshore wind was blowing. Shortly thereafter the disastrous Laingsburg flood of 1981 occurred. Little did I, nor probably anyone at that time, realise that this would be the first of many subsequent so-called cut-off low pressure systems that caused periodical flash floods in the southwestern and southern coastal areas and Klein Karoo, with much damage to infrastructure, agriculture and even the mountain slopes. This also happened to be the weather system that caused the disastrous Knysna fire in 2017, only this time with hurricane force dry winds and high temperatures. During my stint in Knysna, where I have now lived and worked for 36 years, the climate was still fairly normal during the 1980s, with the weather predictable enough to do controlled burning without too much risk, with reliable and predictable seasonal patterns. For example, after bergwinds in the winter months, rain would follow. Rainfall events were frequent, sometimes lasted days, and three weeks of no rain was regarded as a severe drought. Generally the Garden Route had a humid ambience, little wind and no temperature extremes except sometimes with bergwinds in winter. While I was a student at Saasveld and for many years afterwards, the Bergplaas Plantation fire of 1960, which was a disastrous bergwind fire that ravaged the plantation, was regarded as a kind of reference point. Frequency of major forest fires was rated as once in 30 year events until the early 1990s . During the 1980s rotational fire breaks and blocks in the Outeniqua mountains were burnt regularly and mostly successfully. Except for another milestone fire, the so-called Dubbelberg fire, which in November 1984 originated from a block burn that wasn’t quite extinguished. It got out of control with a bergwind, and apart from burning a substantial area of State mountain catchments and a private plantation, it would also have burned down the Goudveld and Karatara State plantations, had it not been for a change of wind to south-west at a critical moment, which brought in cool moist air and rain, and gave the fire fighting teams an opportunity to bring the fire under control. 2) the fire was out of control and even the well equipped fire-fighting teams were no match for it. All we could do was to await the fire on a strategic road on the edge of the plantation. A back-burn was regarded as too risky under the conditions. It was only the change in weather that provided the opportunity to bring the fire under control. 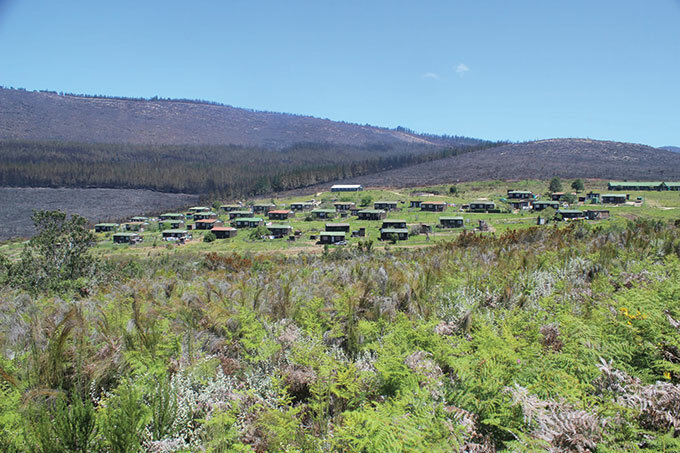 Most of the wildfires that occurred in the southern Cape-Tsitsikamma during the 1980s were quite local and were suppressed by the department’s internal resources. In those years we availed over abundant resources of manpower – highly skilled, experienced and disciplined, under a single line of command, I must add, which cannot always be said of today’s fire fighting operations, although today the technological resources are much more advanced. This changed abruptly from about 1990, when the Outeniqua choo-choo steam train running between Knysna and George started causing veld and forest fires regularly for the first time since it came into being in 1928, and diesel locomotives had to be brought in on high fire danger days. Dry lightning fires occurred in the Buffelsnek-Diepwalle area in mountain veld and plantations in the early 1990s, and we had quite a job extinguishing them as they were not, as usual, followed by rain. 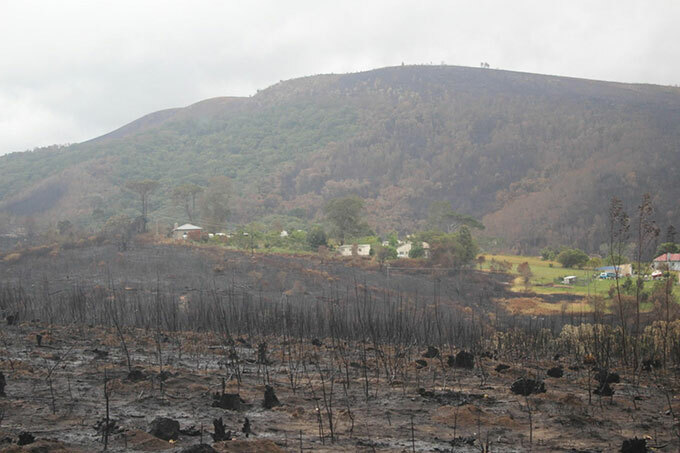 Then some disastrous fires in the late 1990s occurred in the plantations and mountain catchments around George, as well as in the Tsitsikamma. 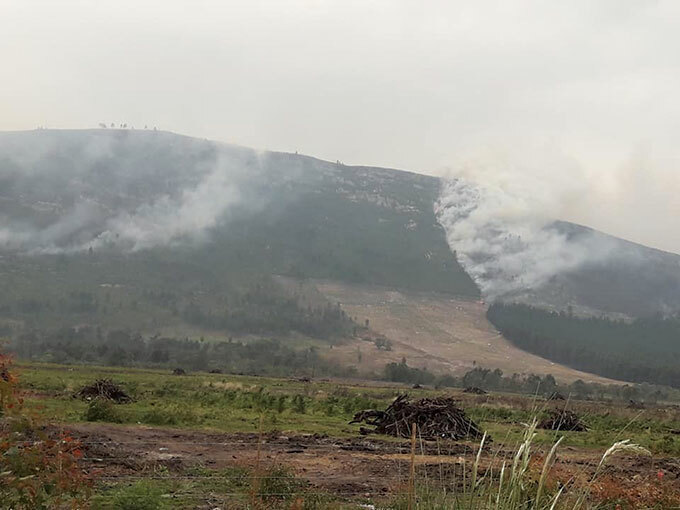 These were the first of a series of disastrous wildfires, inter alia the 2005 Tsitsikamma fire, and finally the Garden Route fires of June 2017 and October-November 2018, which had a serious cumulative impact on the forestry and timber industry. Moreover, fire fighting operations have in recent years escalated to regional, provincial and even national disasters, with the implementation of the incident command system and joint operational centres. This brings me to the hotly debated topic of climate change, whether climate is changing or not, and whether it is man-made or natural. I have no doubt in my mind that we are increasingly experiencing the effects of earth-warming, manifesting in changed weather patterns with deleterious consequences to life on the planet. This has become evident during the past 25 to 30 years. There are various ways in which this change impacts on the weather, fire ecology, fire management and wildfire suppression, regardless of what the exact causes are. You will notice that I have said nothing much about invader vegetation, as I believe that, unlike in the western part of the Western Cape Province, its contribution to fire intensity is exaggerated in the Garden Route in relation to the high fuel load and flammability of the fynbos. Moreover, it’s impact is overridden by the effects of climate change. • Climatologists and ecologists have been predicting how climate change would impact on weather patterns for 20 years, but many people would not listen. The rise in temperatures, droughts and disrupted weather patterns being experienced in the Garden Route area since then are an indication that the scientists were correct in their predictions. • Rainfall would become more erratic and with longer intervals between events. • An increase in extreme weather events would be experienced. • It must be borne in mind that drought is a) not limited to direct lack of rainfall, and b) that drought conditions can occur in spite of normal or above-normal rainfall because of higher average temperature, more desiccating winds and subsequent lower atmospheric moisture. This manifests in higher soil water evaporation and plant transpiration, which dries out the soil and lowers the water table, as well as places vegetation that is adapted to moister conditions under stress. • Following from the above, because of a series of years of experiencing these moisture deficits, it can be safely deducted that underground water tables have been progressively lowered, causing soils to dry out, contributing to the impact of hot wildfires on the organic soil component also in the indigenous forests, where damage to the vital organic topsoil will set back the forest succession for decades in order to gradually build up the topsoil again. This has the effect that more rain is required after fires to saturate the soil in order to extinguish smouldering underground fires, in all cases. • Cyclic weather patterns with high pressure systems alternating with low pressure systems, bringing cold fronts from the Antarctic region, have undergone changes. Cold fronts with moisture laden clouds are increasingly deflected away from the south-western and southern Cape coastal areas, with a concomitant increase in offshore hot dry winds, thus not bringing cool moist air and rain after fire events, as was the situation in the past. Even if some precipitation does occur, it is inadequate to properly extinguish the fires, with the result that hot spots flare up again after the fires have been brought under control. The increased average temperature combined with disrupted weather patterns has caused extreme and freak weather conditions like the hurricane force, very dry winds and high temperatures that have rewritten the handbooks on fire behaviour. The effect of this has been that both intensity and frequency of fires have increased dramatically from the late 1990s onward, with the magnitude of burn scars increasing with each disastrous fire. These are the conditions that have also caused the recent widespread wildfire disasters in California, Greece, Portugal, Spain, Sweden, Australia, and apparently also in Siberia. Intense fires fanned by winds of 100 km/h under heat wave conditions are currently causing unprecedented devastation on a scale against which all fire-fighting efforts are totally helpless. These extreme weather occurrences have this year become the new normal in a state like California, where all past records have been exceeded by the destruction of whole towns and displacement of hundreds of thousands of residents by uncontrolled forest fires. In such circumstances comments made by the President of the United States, Donald Trump, about the repeated disastrous wildfires in California, are simplistic and uncalled for: “There is no reason for these massive, deadly and costly forest fires in California except that forest management is so poor. Billions of dollars are given each year, with so many lives lost, all because of gross mismanagement of the forests,” tweeted Trump. He added that gale force winds picked up and gusted to speeds of over 100 km/h, which caused the George fire to merge with the fire in the Karatara catchment. The increased intensity of this fire caused sparks to be blown several kilometres over wide stretches of indigenous forest, which ordinarily acts as a natural firebreak. Blaming the recent disasters on human error or management failures is likewise an oversimplification, although these aspects are certainly of utmost importance under ‘normal’ conditions. It is a fact that there has been a general decline in skills, experience, effectiveness and preparedness since the days of Forestry in the 1980s, and, although the case of Mr. Trump’s views quoted above is a bit extreme, unfortunately too many people without the necessary expertise in veld and forest fires are the ones that coordinate and take decisions – others again are not capable of managing veld and forest fires in the areas entrusted to their care. There is consensus among fire experts that in the well-known fire triangle making up the elements needed for a fire to burn, viz. fuel, oxygen and ignition / heat, the only one that can really be controlled by human means is fuel. The reasoning is that therefore, quite rightly, emphasis should be placed on pro-actively decreasing the fuel load, mainly by controlled burns. While I agree with this, and while it has worked very well regarding the burning of plantation litter and undergrowth, and block-burning in the mountains in the good old past, the changes in the climate and its unpredictability have radically impacted the feasibility of executing these controlled burns without incurring unacceptable levels of risk. Criticism is being levelled at conservation bodies for not continuing with these practices, as this would supposedly prevent many of the wildfires turning into disasters. In some respects this argument is justified, as the financial resources, capacity and expertise to carry out these burns have seriously declined, and there are indications of neglect in some cases. However, that is only one side of the story. The other side is that the weather has become so unpredictable that the safe burning and mopping up of controlled burns is in most instances not feasible. There are simply no windows of opportunity left in the schedules of these organisations for even taking calculated risks, without being exposed to crippling legal actions and reproaches. A third angle to the subject is that a mosaic of burnt blocks of different ages is only effective during ‘normal’ moderate fire risk periods, as occurred up to the 1980s. Under the extreme weather conditions that caused wildfire disasters lately, these measures have limited use. Moreover, intensity and frequency of freak wildfires make it totally impossible to maintain a system of controlled burns, as the wildfires themselves override these systems and it is often not within human power to determine their course. Even the effective use of back-burning, which is a wonderful tool in skilled and experienced hands, has its limitations of application and bears in itself risks that may be unacceptable. One of the issues that has repeatedly been raised, is why potentially threatening fires are not doused by the deployment of helicopters while weather conditions are still moderate – before they get out of control and assume disastrous proportions. The George fire which entered the Witfontein Plantation was apparently allowed to burn slowly from its origin in the Herold area on top of the Montagu Pass southwards for a couple of days without any decisive action. This fire suddenly got out of control, but was miraculously deflected away from George’s residential areas by a change in the wind direction at the last moment. At the time of writing, some fires are still not completely extinguished. Post mortems have still to be carried out.